Jazz Community Site - Jazz Team Blog » Speed, Coordination & Communication – Is this hockey or Agile Development with Collaborative Lifecycle Management 5.0.2? Speed, Coordination & Communication – Is this hockey or Agile Development with Collaborative Lifecycle Management 5.0.2? Back in September, Rolf Nelson wrote a blog to help launch Collaborative Lifecycle Management (CLM) 5.0.1. So, I thought I’d keep the analogies going as we make our 5.0.2 release generally available. First, I just want to provide some quick background about me and the role I’m in. My name is Brian Lang, and I’m the Product Delivery Lead for CLM. I joined the team in July, transferring over from a team that develops and supports enterprise networking for System z. You might think the change is pretty radical, going from a product that ships over a longer period of time (z/OS) to a product that ships more regularly. The change wasn’t as stark as you’d think. One of the key reasons for that is agile development and how it remains consistent in terms of structure from one team to another. In the PDL role, I serve as the glue between the development and operations teams, a communication conduit that keeps the overall team focused on the final objective: a quality delivery. The other thing about me that’s important is that I’m a hockey fan, and my eldest son plays the game as well. So how does ice hockey compare to agile development? Well, speed is an obvious comparison. Hockey players race around the ice on their 1/8” blades, focused on the puck, their adversary and the location of their teammates. It’s a coordinated dance to ensure that the forwards and defensemen share a single objective: putting the puck in the back of their opponent’s net. It’s a game that demands the speed of the participants, the coordination of their effort and perhaps most importantly the communication between the players on the ice and the coaches on the bench. Sounds very similar to what you need in agile development! As the PDL responsible for the continuous delivery of CLM, speed is of the essence. The transition from shipping the previous release to planning and sprint development of the next needs to be as seamless as possible. Coordination is critical, especially across a solution as broad as CLM, where Jazz Foundation, Rational Team Concert (RTC), Rational Quality Manager (RQM), Rational DOORS Next Generation (RDNG) and the Jazz Reporting Service (JRS) all share the common objective of sprint milestone delivery to jazz.net and ultimately a shared general availability. Communication is a constant, from the regular work item updates to the abundance of email. Focusing that communication on the items that are most critical to our delivery is my job. We tend to focus on the risks, issues and defects that are blocking us. We come together in regular meetings to ensure these obstacles to progress have the required attention of the team. Like hockey, when you’re doing something at high speed that demands intense coordination among different people, there are going to be mistakes. Cleaning up those mistakes by communicating is one clear path to reaching the team’s shared goal. 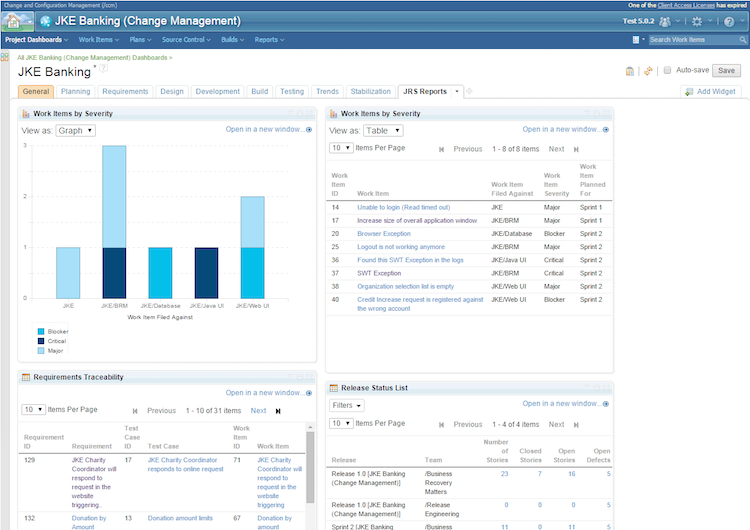 CLM 5.0.2 builds on some key capabilities delivered in 5.0.1. Quick Planner is the rookie of the group. In 5.0.1, Quick Planner shipped as a tech preview, but here in 5.0.2 it is hardened to general availability and fully supported within CLM and RTC. Quick Planner is a web UI-based planning tool that adds complementary planning views to RTC that are focused on the needs of the agile developer. It supports fast work item creation and focused views for the work of the individual user or the team. By focusing on a task oriented design, RTC Quick Planner allows agile developers to get started and be productive right away. You can now create work items rapidly, rank them, triage them and create parent/child relationships with simple keyword syntax or by using icon menu items. Full link history for audits and compliance is an RTC enhancement that enables link audit history to see who created or changed a link in a work item, helping customers control and audit all changes to work items and providing work item traceability. In a world of linked data, knowing who changed what link and when may be just as critical as a code change for ensuring quality and change control. With RTC 5.0.2, the History tab of a work item now includes the link history. An Include Link History check box displays in the upper-right corner of the page. Select this check box to display a history of links that were added to and removed from the work item, such as parent, child, related work item links, as well as any OSLC links. The Reporting team added graphical reports to their existing cross product self-service JRS capabilities. With CLM 5.0.2 the practitioner can not only create reports but also configure a graph version of the report that allows for bar charts, line charts and pie charts in various configurations. The graph and table versions of the report are available for viewing in the same dashboard widget. These aren’t the only updates to CLM 5.0.2. From enhancements to our Kanban capability, to a set of RQM usability enhancements, to embedded document support in RDNG, CLM 5.0.2 contains a rich set of features for your benefit. Please take a look at our New & Noteworthy to learn about all the new capabilities of this release. As I close out this blog, I’d like to highlight an extremely important announcement. CLM 5.0.2 is the version 5 Extended Maintenance Release and is intended for customers that need a long-term deployment for defect and security updates. Version 5.0.2 will provide predictable maintenance for the full software lifecycle. We’re strongly recommending that customers upgrade to 5.0.2 to receive maintenance. Congrats for Quick Planner availability ! Adorn your relationship with the people close to your heart with the beauty of delightful Gifts and make it loveliest. Send Gifts to France through online store at reasonable price and make the occasion grander. Make a perfect accent to this Valentine’s Day by sending our beautiful Flowers and Gifts to your loved ones in France. Whether it’s Flowers for romance, Friendship Day Flowers or Flowers and Gifts for any other occasions, Send Valentine’s Day Flowers to France to convey your cordial wishes.